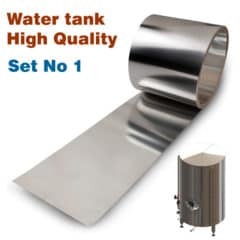 The High Quality set No1 for improvement of the water tanks. It may be used with the Hot water tanks (HWT) or Ice treated water tanks (ITWT) with the capacity from 200 to 4000 liters . The water tank with this High Quality set obtains a very luxury design and enhanced features. Thickness of outer plates 2 mm (not 1mm). All ball valves are replaced by butterfly valves. The High Quality set No2 for improvement of the water tanks. It may be used with the Hot water tanks (HWT) or Ice treated water tanks (ITWT) with the capacity more than 4001 liters . The water tank with this High Quality set obtains a very luxury design and enhanced features. Microbrewery BREWMASTER BSB-51-FM10SNP with the brewhouse Brewmaster BM-50 and 1 pc of a simplified fermentation tank 50 liters allows the production capacity up to 1000 liters of top fermented beer or 600 liters of bottom fermented beer per year using only an infusion brewing method. A simple plug&brew design allows an assembling all microbrewery by customer and easy brewing. Patented brewhouse with computer support produces 55 liters of beer wort per one batch. No requirements for building reconstruction. Manual or semi-automatic control of the brewing process, media and tanks with PLC controllers and PC Windows support. The beer fermentation process is realized in the pressureless stainless steel tank. The beer maturation process is realized in the PET bottles or beer kegs. 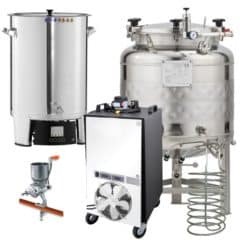 This set includes 1 fermentation set – the set includes one non-insulated stainless steel fermentation tank 50 liters (total capacity 60 liters) , the water cooler with two digital temperature regulators and the thermosensor. The High Quality set No1M for improvement of the brewhouse. It may be used with the manual or semi-automatic controlled brewhouse of types Breworx Classic, Breworx Lite-ME, Breworx Tritank with the production capacity up to 2000 liters per brew. The brewhouse with this High Quality set obtains a very luxury design and enhanced features. Stainless steel grate of service platform. Bigger touch panel of control panel. Microbrewery BREWMASTER BSB-52-F20SNP with the brewhouse Brewmaster BM-50 and 1 pc of simplified fermentation tank 120 liters allows the production capacity up to 2.000 liters of top fermented beer or 1.200 liters of bottom fermented beer per year using only an infusion brewing method. A simple design allows assembling all microbrewery by customer and easy brewing. Patented brewhouse with Android support produces 50 liters of beer wort per one batch. No requirements for building reconstruction. The High Quality set No1A for improvement of the brewhouse. It may be used with the automatic controlled brewhouse of types Breworx Classic, Breworx Lite-ME, Breworx Tritank with the production capacity up to 2000 liters per brew. 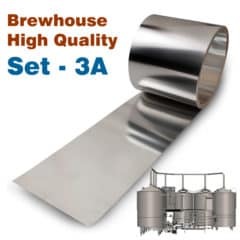 The brewhouse with this High Quality set obtains a very luxury design and enhanced features. Microbrewery BREWMASTER BSB-52-F40SNP with the brewhouse Brewmaster BM-50 and 2 pcs of simplified fermentation tank 120 liters allows the production capacity up to 4.000 liters of top fermented beer or 2.400 liters of bottom fermented beer per year using only an infusion brewing method. A simple design allows assembling all microbrewery by customer and easy brewing. Patented brewhouse with Android support produces 50 liters of beer wort per one batch. No requirements for building reconstruction. This brewery includes one fermentation set – the set includes two non-pressure fermentation tanks, the water cooler with digital temperature regulators and the thermosensors. 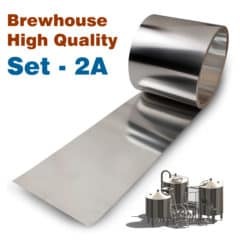 The High Quality set No2M for improvement of the brewhouse. It may be used with the manual or semi-automatic controlled brewhouse of types Breworx Tritank with the production capacity more than 2001 liters per brew. The brewhouse with this High Quality set obtains a very luxury design and enhanced features. Microbrewery BREWMASTER BSB-52-FM20SLP with the brewhouse Brewmaster BM-50 and 1 pc of simplified fermentation-maturation tank 120 liters allows the production capacity up to 2.000 liters of top fermented beer or 1.200 liters of bottom fermented beer per year using only an infusion brewing method. A simple design allows assembling all microbrewery by customer and easy brewing. Patented brewhouse with Android support produces 50 liters of beer wort per one batch. No requirements for building reconstruction. Both beer fermentation and maturation processes are realized in the same low-pressure stainless steel tank with adjustable pressure from 0 to 1.2 bar. Microbrewery BREWMASTER BSB-52-F60SNP with the brewhouse Brewmaster BM-50 and 3 pcs of simplified fermentation tank 120 liters allows the production capacity up to 6.000 liters of top fermented beer or 3.600 liters of bottom fermented beer per year using only an infusion brewing method. A simple design allows assembling all microbrewery by customer and easy brewing. Patented brewhouse with Android support produces 50 liters of beer wort per one batch. No requirements for building reconstruction. The beer fermentation process is realized in the pressureless stainless steel tanks. The beer maturation process is realized in the PET bottles or beer kegs. This brewery includes one fermentation set – the set includes three non-pressure fermentation tanks, the water cooler with digital temperature regulators and the thermosensors. Microbrewery BREWMASTER BSB-51-FM20SNP with the brewhouse Brewmaster BM-50 and 2 pcs of a simplified fermentation tank with useful volume 50 liters allows the production capacity up to 2000 liters of top fermented beer or 1200 liters of bottom fermented beer per year using only an infusion brewing method. A simple plug&brew design allows an assembling all microbrewery by customer and easy brewing. Patented brewhouse with computer support produces 55 liters of beer wort per one batch. No requirements for building reconstruction. 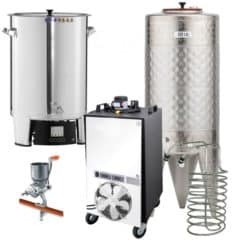 This set includes 2 fermentation sets – each set includes one non-insulated stainless steel fermentation tank 50 liters (total capacity 60 liters) , the water cooler with two digital temperature regulators and the thermosensor. The High Quality set No2A for improvement of the brewhouse. It may be used with the fully-automatic controlled brewhouse of types Breworx Tritank with the production capacity more than 2001 liters per brew. The brewhouse with this High Quality set obtains a very luxury design and enhanced features. Microbrewery BREWMASTER BSB-51-FM30SNP with the brewhouse Brewmaster BM-50 and 3 pcs of a simplified fermentation tank with useful volume 50 liters allows the production capacity up to 3000 liters of top fermented beer or 1800 liters of bottom fermented beer per year using only an infusion brewing method. A simple plug&brew design allows an assembling all microbrewery by customer and easy brewing. Patented brewhouse with computer support produces 55 liters of beer wort per one batch. No requirements for building reconstruction. 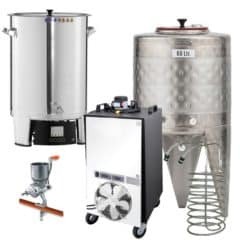 This set includes3 fermentation sets – each set includes one non-insulated stainless steel fermentation tank 50 liters (total capacity 60 liters) , the water cooler with two digital temperature regulators and the thermosensor. Microbrewery BREWMASTER BSB-52-FM40SLP with the brewhouse Brewmaster BM-50 and 2 pcs of simplified fermentation-maturation tank 120 liters allows the production capacity up to 4.000 liters of top fermented beer or 2.400 liters of bottom fermented beer per year using only an infusion brewing method. A simple design allows assembling all microbrewery by customer and easy brewing. Patented brewhouse with Android support produces 50 liters of beer wort per one batch. No requirements for building reconstruction. This brewery includes one fermentation/maturation set – the set includes two low-pressure fermentation tanks, the water cooler with digital temperature regulators and the thermosensors. The High Quality set No3A for improvement of the Oppidum brewhouse. It may be used with the manual or fully-automatic controlled brewhouse of types Breworx Oppidum with the production capacity up to 3000 liters per brew. The Oppidum brewhouse with this High Quality set obtains a very luxury design and enhanced features. Microbrewery BREWMASTER BSB-52-FM60SLP with the brewhouse Brewmaster BM-50 and 3 pcs of simplified fermentation-maturation tank 120 liters allows the production capacity up to 6.000 liters of top fermented beer or 3.600 liters of bottom fermented beer per year using only an infusion brewing method. A simple design allows assembling all microbrewery by customer and easy brewing. Patented brewhouse with Android support produces 50 liters of beer wort per one batch. No requirements for building reconstruction. This brewery includes one fermentation/maturation set – the set includes three low-pressure fermentation tanks, the water cooler with digital temperature regulators and the thermosensors. The High Quality set No4A for improvement of the Oppidum brewhouse. It may be used with the manual or fully-automatic controlled brewhouse of types Breworx Oppidum with the production capacity more than 3001 liters per brew. The Oppidum brewhouse with this High Quality set obtains a very luxury design and enhanced features. Microbrewery BREWMASTER BSB-201-F38SNP with the brewhouse Brewmaster BM-200 and 1 pc of a simplified fermentation tank 240 liters allows the production capacity up to 3.750 liters of top fermented beer or 2.250 liters of bottom fermented beer per year using only an infusion brewing method. A simple plug&brew design allows an assembling all microbrewery by customer and easy brewing. Patented brewhouse with computer support produces 220 liters of beer wort per one batch. No requirements for building reconstruction. 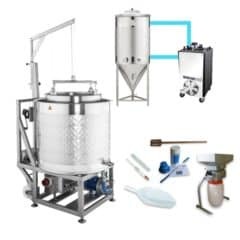 This set includes 1 fermentation set – the set includes either the stainless steel fermentation tank, the water cooler with two digital temperature regulators and the thermosensor.